Get the anti-venom ready for Rattlesnake Canyon! 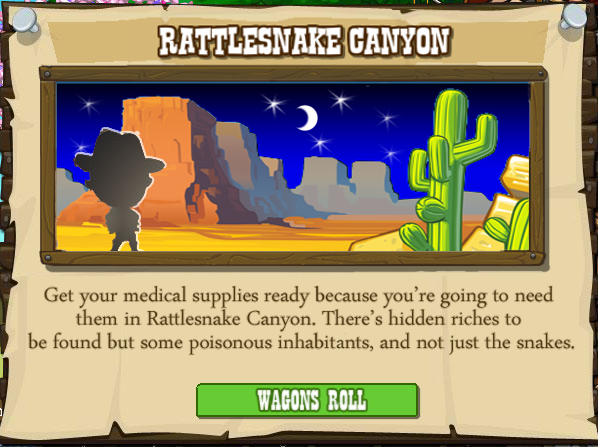 Yes, just when we were all expecting to hear more details about the Oregon Trail it seems Zynga has other ideas on where to send us! All those teases are apparently to guide us in the wrong direction, away from the REAL destination of our first expansion. You'll soon spot that Toto, we're not in Kansas any more! We believe you'll be welcomed and guided through the Canyon in the same way as Jack introduced you to the original homestead but we don't know if the grizzled one will be there again or if a new NPC will be introduced. Hank, Fanny, Bess etc are all left back at the original homestead so it could be that Jack is too, this is unconfirmed. All coins, wood, food and inventory move across, a "derelict" cabin is provided straight off and in the screenshot you'll see that some animals and crops can be planted. From what we can tell there will only be limited crops available because of the different land type perhaps? 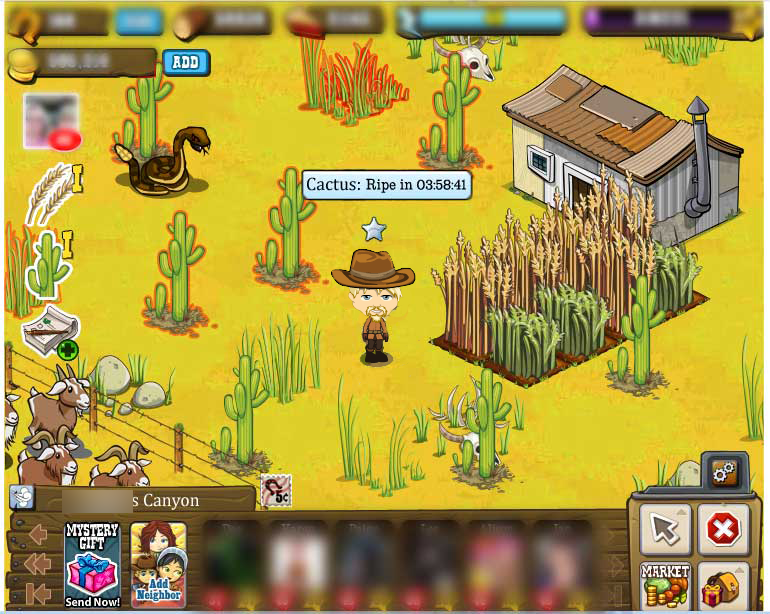 The canyon's yellow background suggests a more arid environment than the fertile fields of the old homestead. Yes, it appears CACTUSES are now harvestable items, apparently in the same way as trees are now, so not disappearing and needing replanting. Whether they will still only be available as debris or a horseshoe purchase we really don't know. 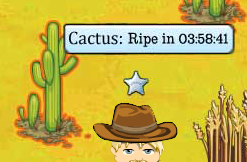 It appears the Markets vary depending on where you are so even if Cactuses are buyable, it doesn't mean that they'll be available on the homestead for coins. There will also be a limited choice of animals it seems, with just goats, cows and oxen open for purchase but there is a suggestion of new animals including proper brown buffalo that begin in the same fashion as the injured animal but actually grow. Because of changes to the game some varmints are also not in Rattlesnake Canyon, there are no Foxes or Coyotes, seemingly because there's no chickens, geese or turkeys (we've yet to discover if "disallowed" animals in your inventory can be placed, probably not) and there's no bears because there's no lumber trees growing (Wood can only be got as a resource from the original homestead although we believe thorns might grow in the canyon). Groundhogs will still pop from crops but at a reduced rate. Obviously with the name of the place Rattlesnakes can also appear and apparently have been set to attack from more than just debris, they can also appear when harvesting crops and tending to animals. However, instead of the multi-clobber varmints they are on the homestead the bigger chance of them appearing is offset by them being a single-clobber varmint, in the same fashion as the Coyote. 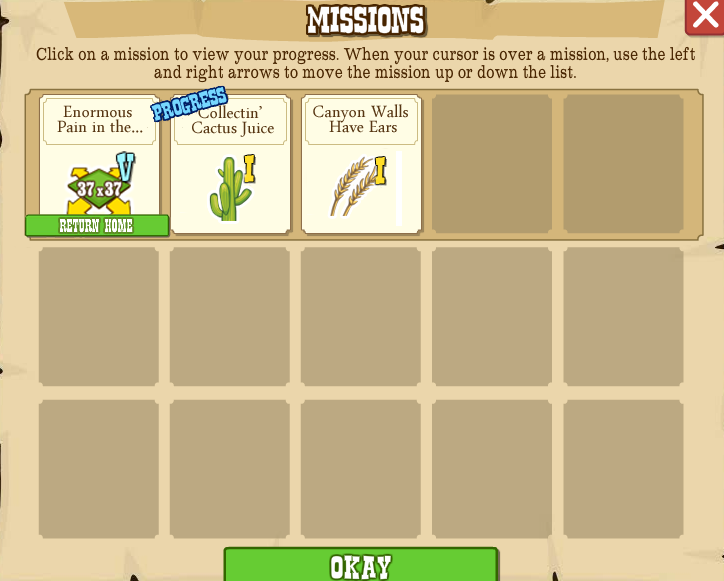 As you can see, the missions so far seem to be introducing the new harvestable Cactuses and requiring the planting of wheat, possibly a plotline about setting up camp and making sure the new area has food? As it stands we don't have specific details on these missions but we'll try to bring them to you ASAP. 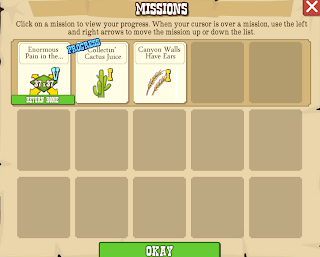 Apparently the new Missions window will show missions from both Homesteads (we're not sure if the mission numbers are specifically coloured blue for Home and yellow for the Canyon or if this is just random). It seems though that nothing you do on a different stead will count towards the other, so harvesting wheat at Home won't count towards the mission on the Canyon. As you can see, it appears that any mission from Home will have a return button under it to take you back to your original homestead. The 12 Days Of Oregon Trailing! Get Yourself A Faithful Friend!